If a boat is sinking, who will abogado Chel Diokno save between President Rodrigo Duterte and House Speaker Gloria Macapagal Arroyo? 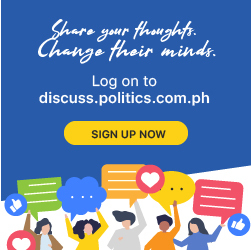 Diokno was faced with the hypothetical dilemma of saving a controversial politiko during ABS-CBN’s senatorial debate, titled “Harapan 2019,” on Sunday. His witty response drew laughs from the audience. Diokno is part of the “Otso Diretso” opposition senatorial slate.